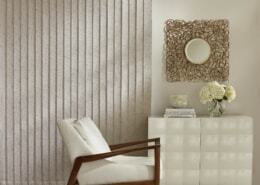 Exclusive fabrics available with Alustra Woven Textures provide a unique vertical shade option. 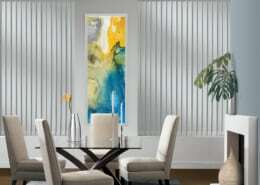 The patented dual-channel headrail allows for an ample number of panels while maintaining a sleek profile. The unique panel hanging system provides minimal stackback for maximum view-through. Combine Alustra Woven Textures Roller Shades with Alustra Skyline Gliding Window Panels to cover windows and doors in unparalleled style.